Hi! I love the podcast and have been a lurker (both here and at the also excellent X-aminations) for a while. The Tarot of the Cat People is a real thing! 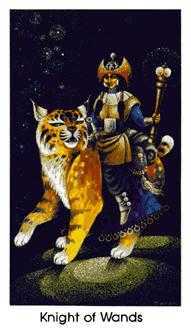 It’s a tarot deck featuring fantasy people and cats. Presumably it wasn’t really made by cat people, but in the Marvel Universe, who knows? I think it’s awfully pretty. And allowing for art style, the figure Tarot summons looks like the Knight of Wands from the deck, although sadly without his tiger mount. Andre Norton wrote two books inspired by it/set in its world, which is how I knew it existed. Really fun episode. I was reading along on Marvel Unlimited as I was listening and I feel like Darick Robertson was deliberately referencing Bob McLeod’s Cannonball. I wish he had drawn Sam more. Btw, we need to remember that horses are evil and therefore Butterrum probably deserved it. Oooh Hellions discussion! I am SO here for this! Always nice to see some slamming of Empath, who IS the objective worst! Firestar isn’t so much an inversion of Kitty’s origin, as an echo, since Kitty was going to go to Emma’s school (which was a LOT more prestigous than Xavier’s) until Jean Grey/Phoenix took it upon herself to rewrite Mr and Mrs Pryde’s minds so they’d send her to Xavier’s, an action Charles objected to, but notably did nothing to undo. Firestar flying by microwavimg thermal updrafts is some prime power-babble, though I will always use the benchmark that Storm, the famed “wind-rider”, flies by essentially blasting a hurricane up her own backside and being able to hold her balance REALLY well. My favourite take on Tarot (apart from the Waiting for the Trade cartoon which has her expand into baseball and Pokemon cards) is from an old fanfic “Go West!”, which postulates that she’s the granddaughter of a character from the 1980’s “Amazing Stories” TV episode “The Mission”, the one with the WWII plane that can’t land because of a stuck landing gear and then.. well if you know the episode you see the connection, if you don’t I won’t spoil it for you. Also that the limit to her powers was that she had to have painted the tarot deck she used herself, so they were her creations and there was something of HER in each card she used. She had a couple of others that she could use beyond the normal Rider-Waite deck, an elemental deck that gave her various powers over water and air etc, but painting all 78 tarot cards was not something done lightly and required her to focus her powers specifically, so she didn’t have an endless supply on hand. Apparently she’s still around after being resurrected through some odd and creepy application of her power which she felt really awful about and which changed her powers so she now became whatever card she drew. (I assume the corpse which showed up in Necrosha is her original dead body, and as such distinct from the new body she got for her in the meantime). Most recently she was seen with a new look fighting Spider-Man and Deadpool. Jetstream was a specifically Moroccan and didn’t just use a jetpack, he had the same powers as Cannonball, but without the invulnerability, so the first time his powers kicked in he burned himself nearly fatally, and it took cybernetic implants to repair him, and since the Hellfire Club footed the bill, he was working off a life debt to them. A shame that we never saw more of Bevatron and Beef, they seemed like a good fit. Austin was a great co-host… did someone forget to turn the voice FX off for a while, or does he just sound like that? Either option seems plausible. Whoops – voice FX fixed! You can delete and re-download the episode if you’d like a clean copy. Thanks for the heads-up! About halfway through, and I won’t be redownloading, thank you very much! Mr. Gorton sounds fabulous like that. I shall be treasuring my rare early recording of this episode and using it as one of the main weapons of my podcast hipsterdom when one-upping other podcast listeners. In regards to mutant powers matching the personality of the character, Pratchett invented an element called Narrativium. In a world with a lot of narrativium, it’s impossible for the youngest son to succeed in a quest that killed all his brothers. Likewise, in the Marvel universe, it’s impossible for an Australian not to gain kangaroo or boomerang powers. It’s impossible for a Kentucky boy named after the guy who invented percussion powder not to end up in a coal mine and exploding. He could try all he likes to gain iron skin or tentacles and work in a supermarket, but Narrativium is going to make that boy explode in a coal mine. lol, I thought that seemed a little strange. LONG TIME Gentlemen of Leisure reader (and podcast listener) and I would give SO MUCH Patreon money for you two to be a regular show in some way. -The comment about Nicieza’s attention to continuity prompted the thought that these issues show the Jekyll and Hyde sides of that feature of his writing. – #10 is a really good example of how something whose plot really doesn’t have much more to it than “They fight!” can be made interesting, and making it all turn on Angelica’s backstory is part of how this fight is much more than just people hitting one another. It’s another reason to regret the killing of the Hellions that it took them off the table for more encounters with the New Warriors, with whom they turn out to work extremely well. Although I can’t put my finger on exactly why — it’s more than just “They’re both made of young people.” It might be that the New Warriors are young people at different ages who are quite different from one another and are together out of their individual choies, and that constrasts really well with the regimented and uniformed private-school students who all obey their headmistress. But, anyway, they do work well together, and the creation of Beef and Bevatron suggests that Nicieza had plans for them that we never got to see. In fact, I hate to say it, but reading #10 again put the recent turn in the X-Force issues that the podcast has been covering in perspective, and reminded me that Nicieza maybe wasn’t bringing his A-game to either of his X-books, even if X-Force became the better of the two. Nicieza is just so much better when he doesn’t have the cold dead hand of Chris Claremont gripping him and draining the life out of his writing. Anyway, whether or not that’s actually the case, it reads as if it is. From the beginning, it’s suggested to the reader that the reason for this story is to “fix” a plausibility problem that the characters themselves should have noticed. This is not the best way to get your reader invested in your story, I think, at least not the superhero-comics reader, for whom “real-world plausibility” is not likely to be high on the list of priorities. But the actual retcon does have its merits. Read as either a New Warriors story or an X-Force story, or for that matter a New Mutants story, there’s something rather good about the idea of Selene basically creating her own Ancient Rome theme park and forcing it to remain static because she loved living at that time so much. (Presumably because she could buy as many slaves to feed on as she liked.) It jibes with what our hosts persuaded me to like about the Externals in criticizing them — it’s another statement that old people who want to turn back the clock are the real threat. Part of this, for me, is that unlike our hosts, I really like Selene, at least as Claremont wrote her in the ‘80s. She’s a great version of that X-thing where you take something from another genre (in this case vampire horror) and write it as a mutant, and then Claremont inserted that into a sword-and-sandals technicolor Roman epic. I am so there for that kind of genre mashup. And this elegantly turns that up a notch, by making the sword-and-sandal aspect Selene, in effect, writing, casting, and directing her own Quo Vadis or Spartacus or whatever for her to live in. Plus, in this specific context, this puts its finger on one of the problems with Claremont’s Nova Roma, which is that it’s really quite racist. Supposedly, this society is composed of descendants of people from the ancient Mediterranean who have been living and intermarrying with indigenous South Americans in the Amazon for over two thousand years. And yet, everyone looks completely European. In fact, they don’t even look particularly Italian – they look like they’re all from Norway. There’s a great story here that would bring all that out – that would show Selene forcing Nova Roma to remain trapped in her idealized “pure” version of it, show her specifically “casting” European-looking people to play her “Romans” to suit her mental image. But ithat would be a *Selene* story. It’s a serious problem that the most interesting character for this story isn’t actually in it. Selene is no more than a throwaway plot device. Instead of her, we have Empath. That could sort of work, if his motivation, that Nova Roma was the only place that he’d ever been happy, had been fleshed out a bit. But it’s merely gestured at. In fact, bluntly, that motivation seems much like Selene, just another plot device to plug a hole in a retcon that’s being done for its own sake. – Also, if any story justifies us in nitpicking continuity, this one does. And this isn’t how Empath’s powers work! He affects emotion. He might be able to change your emotional attitude to the information that you know, but he can’t edit the contents of that information so as to give you a completely false set of memories about who you are. Arguably, you could solve that by saying that what he’s actually done is make people overwhelmingly terrified of letting the pretence down, so that everyone knows that this is all a facade, but no-one can admit it. (Might have good nightmare potential.) But this is clearly not what the story portrays: “Amara” has forgotten that she’s really “Alison Crestmere.” Also, that couldn’t teach everyone in Nova Roma to speak Latin fluently, as they did back in the Claremont era. As a fan of both X-Aminations and the podcast, this episode was great. “There are simply no flags red enough” is the best & only descriptions you’ll never need for Empath. He’s one of the best villains cuz he’s one of the worst and has zero redeem-ability. As the world’s biggest Hellions fan, this episode was a treat. It feels weird that the mourning/closure for the team was in New Warriors; you’d expect the X-team members with close bonds to the Hellions, like Cannonball or Wolfsbane, would have some sort of reaction. But that era was chaos, and I’m sure the creators at that time saw the team as disposable. Does Jetstream qualify as a disabled hero? He’s a double amputee, and his jetpack is attacked to prosthetic legs; it’s suggested that he’s basically blackmailed by the Hellfire Club into staying despite finding them morally repugnant by threatening to remove his new legs, which is probably why he’s such a jerk. I never liked the Nova Roma retcon; like Austin says, it’s no less plausible & silly than the Savage Land, and it never goes anywhere. Like the Hellions’ slaughter, it felt like change for change’s sake with no plans in place except to break other people’s toys. I sort of feel that, in honor of the late Pete Shelley, we should today be debating whether ”Homo superior, in my interior” was a deliberate X-Men reference or not. At any rate, it was a missed opportunity for the X-Men: Apocalypse soundtrack. Regarding Magma’s other name (Alison Crestmere) I know it as the name of the version of Magma from the X-Men Legends video game. 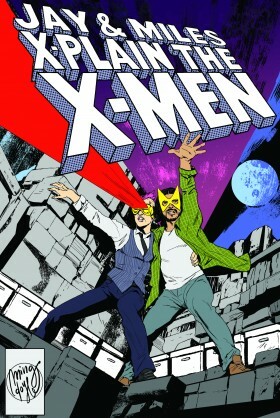 It looks like the X-Treme X-Men issue in which Chris Claremont changed Magma’s name back was written while the game was still in development. X-Men Legends and its sequel seem to now be considered their own alternate universe (Earth-7964), but the 1st game is a strange mix of Ultimate X-Men designs with some side-missions and trivia games based upon the main Marvel universe. Alison didn’t have much in common with Amara from Earth-616 (don’t know about Earth-1610’s) and she was the most central character of the game’s story, though you could play most of it without using her. Alison’s powers are basically Amara’s, but with the addition of being the thing which can save the day when Magneto pulls off the scheme from Pryde of the X-Men. Alison was not in the sequel, X-Men Legends II: Rise of Apocalypse, which is generally a better game, but Jay & Miles will probably be mad at Mystique’s “friendship” with Destiny.